My little blog has (almost) reached 600 followers and I also have 1100 followers on Twitter. Additionally, today is my birthday, so I’ve decided to celebrate by having a book giveaway! 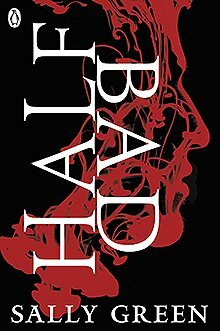 I’m giving away my latest favourite book: a copy of HALF BAD by Sally Green (paperback edition). The giveaway is open until Sunday 23d March 2014 at 9pm (BST time). It’s open Internationally, as long as the Book Depository ships to your country. To enter please fill in the contact form below with your name and email. Since this giveaway is to thank my followers, you have to follow my blog via email or WordPress to enter. If you are a Twitter follower, if you like my page on Facebook, if you follow me on Pinterest or Tumblr, or if you tweet about the giveaway, this will grant you an extra entry. Mention it below. This entry was posted in Uncategorized and tagged book giveaway, EM Castellan, Half Bad, Sally Green, YA Books, Young Adult literature. Thank you for all this awesome content you give us on your blog!! And congrats on your followers! Also Happy Birthday & congrats on 600. That’s huge!!! Congratulations on this awesome milestone and Happy Happy Birthday!! !